Our Black Pawprints Large Dog Bed is designed with comfort in mind. This luxurious Bed will bestow your pet with ultimate comfort, fantastic sleeping experience and will also make a stylish addition to your home decor. Filled with 100% hollow fibre, our black pawprint dog bed is very plump to give your dog an additional support while sleeping. 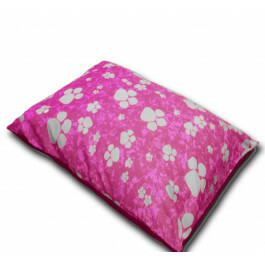 Cased with high quality polycotton blend, this dog bed is highly durable and soft to give your dear pet the comfort it deserves. The white paw prints on black background looks extremely adorable and trendy.